Aluminum, Steel, Stainless Steel, Brass, Copper - Call Us Today For A Quote! Expert knowledge, experience and guidance to assist you. Proudly serving Texas for over 50 years! 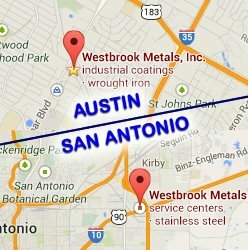 Westbrook Metals, Inc. has operated in Central and South Texas since 1955. 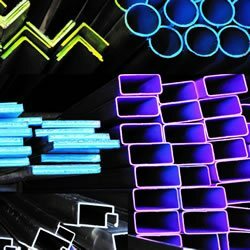 Whether you need a small amount of stainless steel round bar or a large quantity of tread-bright aluminum, we can help! We FULFILL ORDERS for LESS THAN FULL STANDARD LENGTHS! 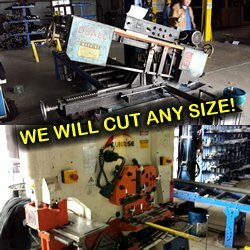 We can cut bar stock with multiple bandsaws. We can shear or saw cut sheet and plate products to your size requirements. Multiple cuts are no problem with our automatic indexing bandsaws. Stainless Steel, Aluminum, Carbon Steel, Alloy Steel, Brass, Copper, Tool Steel, Drill Rod, Architectural Metals, Titanium, A36 Mild Steel and more!